Not a BIG SNOW kind of a morning, but snow just the same. NO snow day. Boo. I must get organized because I have to make a grocery store stop before school. I'd LIKE to take it easy and slow today. Oh well. I'll put on a happy face. I've been having coconut milk or nothing in my coffee. I'm trying to break my coffee creamer habit. It's so hard. I wish I had never moved from black coffee to delicious looking tan coffee. I'm going to keep at it. It's still pitch black outside and lighted corners remind me that it is not spring yet. Tomorrow IS the love month and as January comes to a close, let's give ourselves a pat on the back for soldiering through some wacky weather and a nice new beginning. We are headed to spring's sweet gifts of tulips, daffodils, hyacinths, crocus, AND Easter. We don't have much of a spring in Colorado. It can freeze in early May. It's nice to remain optimistic just the same. My eraser was very smudgy this morning, but here's a happy little girl and her dog. I was reading a letter that the apostle Paul wrote to Timothy and I liked reading one of Paul's requests. He asked if when Timothy came he would bring him a coat, his books, and his papers. Where are your books and papers? When I go upstairs to iron a bit before school, I am going to feast my eyes on my books and papers. I do love them. Well, that'll do for my little "hello to you" post for today. Warm wishes. I thank my Jenny for introducing me to sweet peppers by the bag. YUM! Aren't they gorgeous? I've even been in love with them enough to take the time to make myself a lovely salad for lunch. Yesterday, I was finishing my salad after school and a bunch of kids were in the room for Homework Club. They were fascinated with my salad and the brown egg I ate. They had never seen a brown egg. Even the peelings are pretty when we make salads. I leave you with another quote that has to do with your faith AND your intention. "When a man sets out on a journey to a great city, every step he takes is voluntary; he does not need to say, "I wish to go to the great city, I wish to go to the great city." That first step is an indication of his intention. He journeys without saying it, but he cannot journey without intending it." Thank you for popping on by, friends! When I went to Walmart to buy those donuts, I noticed Lowly! I hadn't seen him before. Isn't he cute? I think it is very literary of Walmart to provide a ride in Lowly Worm's apple, don't you? This is Jenny's nice cat named George. Isn't he beautiful? I love his softness and his unique stripes. He was having a sun bath. Jenny made me a sunny salad for lunch. It was delicious. The asparagus tasted like Easter. Plum Cake napped and Sam and I talked. I love her little self. Do you see where Granny gave her a big smooch? The hyacinths are still so gorgeous and fragrant. Apples, lemons and a tangelo shine so bright! A week later the tulips are a lighter shade of pink. The green of their stems and the smell of their faces = bliss. "Grandmother was small and withered and gave the impression of having shed everything in her passage through life except the essence of herself, and that sharp, decided, wholesome essence. Her twinkling black eyes were like a bird's, and as sharp as needles, and her little parchment-colored face was wrinkled into a thousand lines of humor and decision and common-sensible strong-mindedness. Her iron-gray hair was arranged in corkscrew curls, the fashion of a past age, and on her head was a cap with purple bows. Her gray dress was of great age and made of alpaca so stiff that it could surely stand by itself, and her hands were mittened. She was eighty years old but neither age nor bereavement nor hard work had in the least dimmed her vitality or stemmed the flow of her fluent, emphatic talk." "Stay here and do nothing," he advised him. "Stay a year if you like. What does it matter? It's often necessary in life to do nothing, but so few people do it nicely. And as for peace, there's plenty of it in this house and in this town. They are so weighted with age that they have, as it were, fallen below the surface of time, like a buried city below the sea . . . Fall with them . . . Dear me, I must go and say evensong or I shall be late for dinner, and that distresses your dear grandmother." I enjoy Elizabeth Goudge because I MUST take her writing slow. There is no rushing. I need a lot of quiet to read her writing style. That's a good thing. 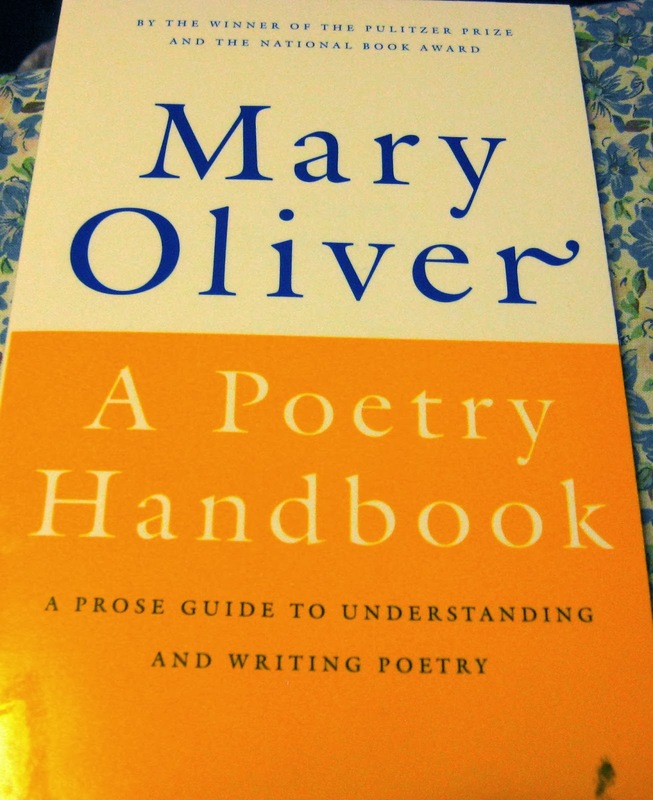 I'll need quiet to read Mary Oliver's guide to poetry, too. Yippee! I went to Hobby Lobby yesterday and I was amazed at how crowded it was. There were men, women, and children shopping for creative materials. Isn't that encouraging? 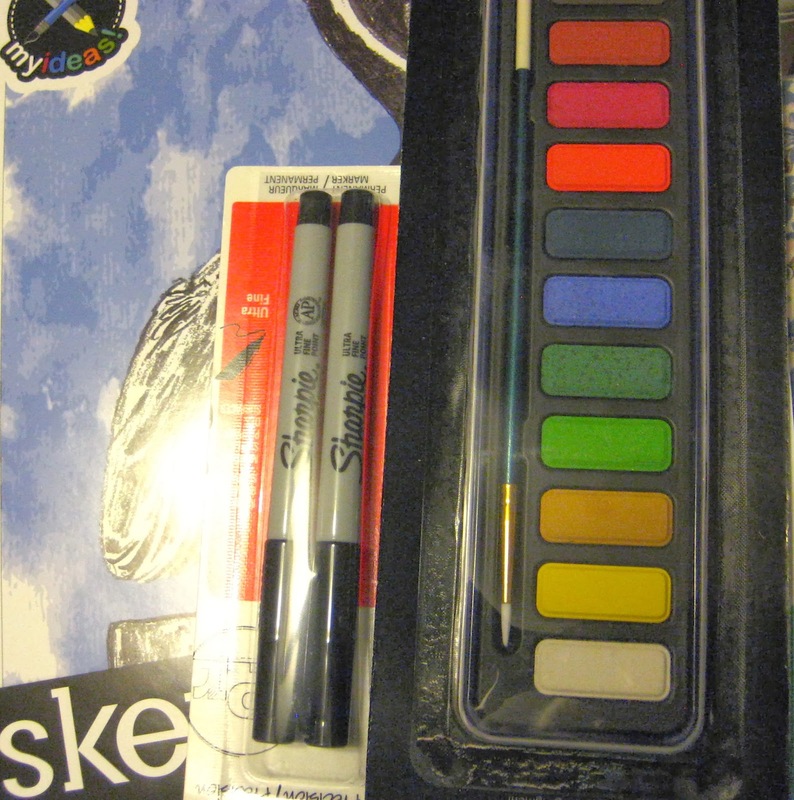 This is the nicest tray of watercolors I've ever had. I like to outline with Sharpie pen. My polka dot scarf is gracing the ironing basket. SO pretty. I think I'll paint this afternoon when the sun shines through my little den's window. I'll take a warm walk because tomorrow the temperature is going to dip and more snow will come. Oh, I DO love weekends. I hope your weekend has been full of smooth sailing, too. Does January seem rather long to you? Jan. 1 seems like FOREVER ago to me. One more week and then the LOVE month. We have birthdays in February and I'm planning on eating quite a bit of chocolate. I am also planning on eating cream eggs and chocolate bunnies as soon as the Valentine candy has been replaced with the Easter candy. I've been drinking tea at school. Tea seems to go well with poetry. Yesterday the reading class painted, too. We copied a poem onto the middle of a big page and then watercolored around it. Such art! I played great Mexican guitar music while they worked. It was a very good day. 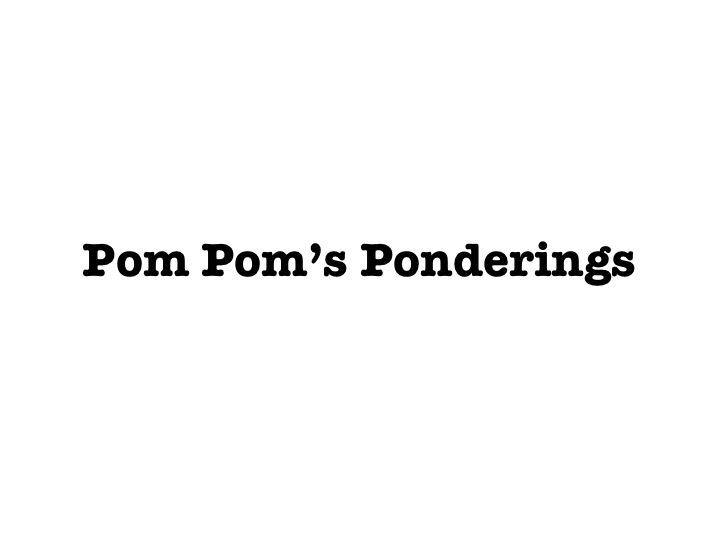 Even though some of the sixth graders are beginning to grow up into the rocky period of being a teenager, a lot of them are still very childlike. I love it. Innocent faces. Messy hair. Open-faced smiles. Precious. I'm very glad it is Friday. I miss home and I love Saturday morning sit arounds. This is Millie's baby hand holding my heart brooch. Aw. Look at those fresh pink fingers and the cheerful printed sleeve. I must stop at the store today to purchase some promised donuts for the afternoon class (they were great for the substitute teacher last week). I'm going to stroll down the Valentine aisle and see if there are any irresistible goodies there. Oh, and I hope I remember to buy some chocolate for break time munching. What is your favorite chocolate treat? Love love love coming your way . . .
We are enjoying VERY blue skies here in Colorado. Oh, it is a blue so blue. We've lived here for 22 years and the blue skies are a sweet feature of the Mile High City! Do you see all those sticky tree branches? I think I'll start picking up twigs for making crosses. I highly recommend the book Making Crosses by Ellen Morris Prewhitt. Easter is a coming! Yay! See our Rocky Mountains? White with snow. How lovely on the mountains are the feet of them who bring good news. The tulip friends keep ringing their bell-shaped bodies. Do buy yourself some. They soothe. Gnomes to remind you of your garden and hearts to remind you of LOVE DAY! I bought the heart mugs at the grocery store a few years ago and I bought the beribboned hearts at Walmart. Such happy heartiness! On the cheap, too! I hope your squishy heart of love emits huge puffs of gentleness today! Quiet smiles. Acknowledging nods of your lovely head. Oh Lord, help me to pay close attention today, to faces, to the bearers of burdens, to your great work. Amen. Bill and I went to the grocery store very early this morning. Later the market will be full of football game shoppers! Go Broncos! (Go Seahawks, too!) Finally, I did some flower shopping! More of that later. Last night we gathered at Kelli's for dinner. EVERYONE was there! Our whole group! Us, four kids, four spouses, nine grands! I got side-tracked and neglected my camera, but I did take these few cute pics. The boys. Sweet messy faces. Finn's lopsided grin. LOVE. Millie slept in yesterday and decided to wear her pajamas all day. Smart girl. Aria ALWAYS wears a headband and MOST OF THE TIME, a tutu. Another smart girl. April helped Kelli hang more curtains. I love black and white buffalo checked curtains! Another smart girl! I traveled down to the daylight basement to find more grands. Aw! 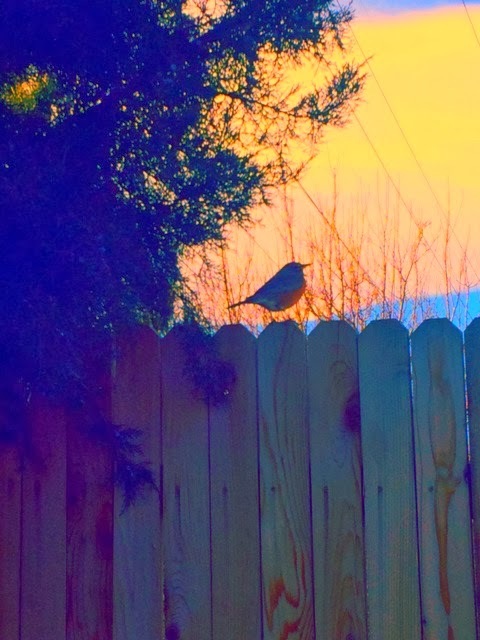 Bird always gives me a lovely greeting! GRANNY! Isn't Cadence's hair so cute? I love her glasses, too. I love HER, period. She's a dream. Miss Bug gave me lots of hugs and cuddles, too. Oh, how I love grands! Sam and Lizzy arrived later after I lost track of my camera. Jeff and Christie came and brought Christie's nephew, but again the camera was not handy. While in the basement, I looked around a bit. Let's play I Spy. Do you see a few fairies? How about Cinderella's fairy godmother? Can you find the prince? He's taking a nap. I like the wooden shelf with the plant on top. Sweet little things. Aria the darling. I got to hold her while she napped through dinner. Three year olds get so tired. They don't necessarily need naps but they aren't completely ready to give them up, so we often get exhausted "crashes" just before it's time to eat. Okay, back to the flower shopping. Tulips are SO juicy! Don't they look good enough to make into a fine tulip salad? I pressed one in the teacher edition of the sixth grade textbook and it DID spread a bit of juice on that particular page. Ooooops. I like this combo - tulips and yellow roses. Lovely. And the flower corner has hydrangeas! So many colors! SO beautiful! Kitchen herbs! It's too early for me to buy these pretties. I don't have a sunny enough spot for them and if I place them on the window sill in our bedroom, they might freeze. It is winter and winter in Denver can be harsh. I chose the hyacinth at the top (yay for bulbs!) 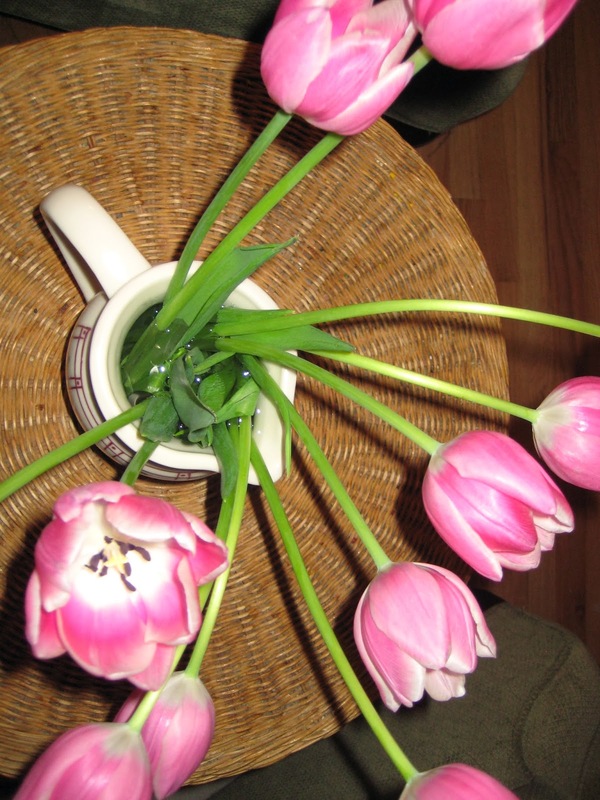 and pink tulips. I'm so glad! Bill's still extremely jet-lagged so he's napping away upstairs. I did ALL my ironing yesterday. Every bit. The basket is empty. There is chicken in the cast iron pot and IF I watch the football game, I shall eat salt and vinegar potato chips (crisps?) and drink root beer. That's a simple pleasure, right? And tomorrow? Another free day! GRATEFUL!